What if you had to flee your country—the only home you have ever known—leaving your parents behind and taking with you the young siblings you were charged to protect? Bukky Olarewaju Agboola was faced with this terrifying obstacle as a young woman, fresh from college graduation. She knew she had to protect her siblings and to do so, she would have to leave Nigeria. 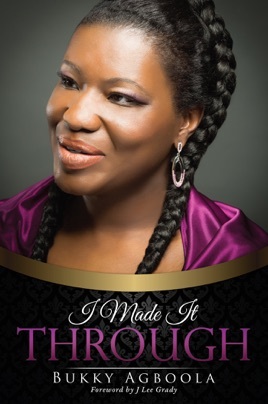 A captivating story of sacrifice, strength, and love, I Made it Through touches on what it means to truly have faith in God’s master plan. Overcoming adversity and barriers to a life of stability, Agboola shares how God saw her through the darkness into the light at the end. A 21st Century display of what real faith can do in an ordinary life....The Extraordinary! I have read it twice(so far). It gives remarkable insight & "Life Keys" on living and fulfilling God given destiny and purpose. Real, funny. And powerful with no frills. A life challenger and changer. Read and be blessed!! Thank you Pastor Bukky for sharing intimate details of your walk with Jesus ! You and Pastor Jide were my biggest Christian support system who led me back to my faith . You both patiently preached and taught me the Word of God through weekly Bible studies , prayer meetings and worship services . You did a lot of one on one with me . I praise God for both of you !